Brittany Stodgell in front of her mural at Nectar Wine and Beer in Kendall Yards. Procrastination is Brittany Stodgell's incentive for inspiration. It's what drove her to stay up through the night before a solo art show at the start of the year and paint — from start to finish — a 5-foot-by-2-foot acrylic piece. It's why she created a series of watercolors using a technique she'd never used before, just hours before an evening First Friday event in March. The 29-year-old artist followed a similar timeline leading up to the submission deadline for 2013's Terrain, the popular, one-night arts showcase held in October. "Procrastination is my best friend," Stodgell says, laughing. "It's stressful, but it forces me to create. When I have a deadline that's months away, I come up with too many ideas instead of focusing on one. But when I have a hard deadline, I can sit and focus on one idea and get everything done." Her other weakness? Not saying no. "When people offer projects, I usually have to tell them, 'OK, but I have these things in my personal pipeline,'" she says. As she was settling into a new job last month, as a graphic designer at downtown firm Propaganda Creative, Stodgell agreed to personally design posters at low or no cost for the recent Startup Weekend Spokane and the 50 Hour Slam Audience Choice film screening. 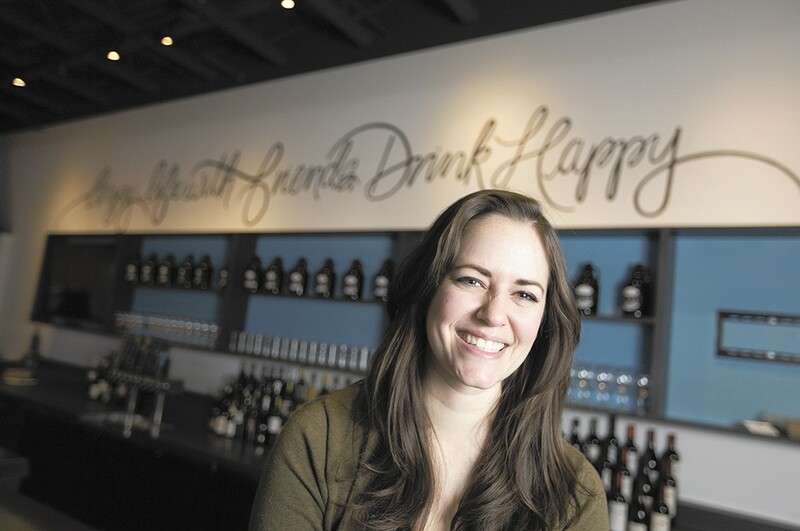 In addition, she was working on another project to hand-letter phrases onto the walls of newly opened Nectar Wine and Beer in Kendall Yards. Beyond finding the artist's signature bold, fluid lines and shapes in these places, her work is featured in many notable local projects. She designed a 40th anniversary Expo '74 logo for the Spokane Parks Foundation's gala last year. In 2013, she co-founded Halftone, an annual group art show that raises funds for area nonprofits and Eastern Washington University's visual communication design program, of which she's a graduate. While most of her recent projects have been in lettering and digital design, Stodgell also dabbles in drawing, painting and photography. "I just like to create. I try to do something artistic every day," she notes. "Every piece of art has a sense of purpose to me, so I rarely throw anything away or shove it in a corner. I find a use for everything I create." Stodgell and her best friend and fellow artist, Amanda Johnson, also co-own Black Sheep Paper Co. a greeting card and print shop on Etsy. They sold their cute, pun-laden and geek-themed designs (based on Star Wars, The Legend of Zelda, rap lyrics and old-fashioned idioms) at Terrain's sister event Bazaar last summer, and plan to return again this year. Of all the hand-lettered prints Stodgell has designed, the most popular sales-wise are a kitchen-themed, black-and-white set of prints inspired by rap lyrics: "When you dip / I dip / we dip," hand-lettered above a bowl of chip dip, and "big pimpin' / spendin' cheese," with a wedge of Swiss, and two other popular songs with associated food puns. She projects an amiable and effervescent charisma, yet Stodgell labels herself an introvert, and in the past, she was much more critical of her art style. 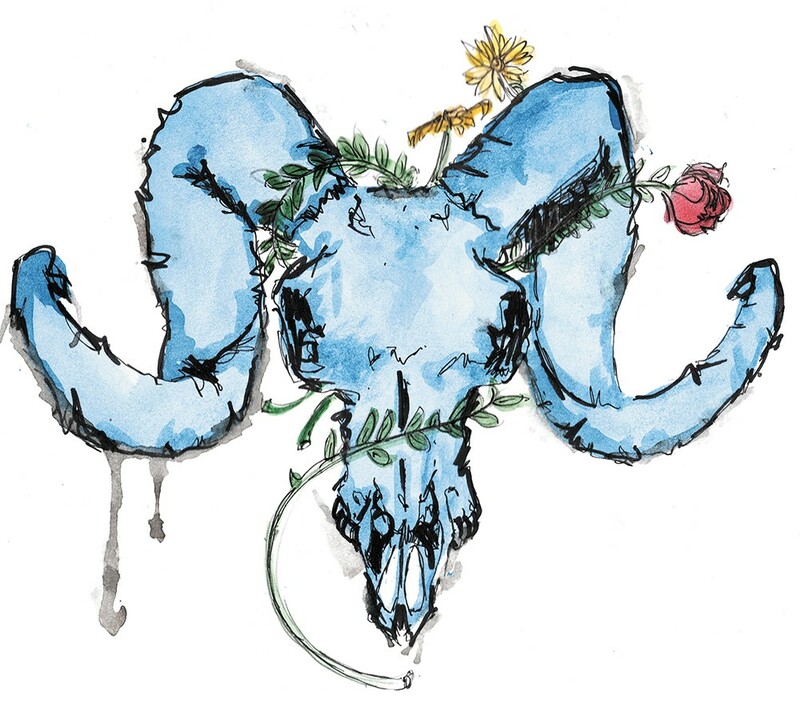 A piece from Stodgell’s “Blue Skull Set” watercolor series. "The biggest thing I'm proud of overcoming is that I used to think my artwork and design was no good, because it wasn't like anyone else's," she recalls. "Two weeks into my first quarter of the last year of my design degree, I was astonished by the talent I was surrounded by, and I looked at my work and thought, 'It looks nothing like theirs, so it must not be good.'" She credits EWU design professor Travis Masingale, who has continued to play a mentoring role, with helping her stay motivated to continue her arts education.